Desk name tags drive me nuts. So when I saw this idea (source) and just HAD to share it with you! Use an oil based Sharpie Paint Pen (available at craft and office supply stores) to write on the desk. It stays on just like a permanent marker, but you can see it better. Then at the end of the year when you’re ready to take it off, color over it with a whiteboard marker and it wipes off with a tissue! This same idea of erasing permanent marker with whiteboard markers also works on whiteboards, laminated posters, anchor charts, etc. This entry was posted in Addition, Classroom & Decor, Letters/Sounds, Management, Math, Math Games, Multiplication, Organization, Writing and tagged Games, handwriting, Math, math games, multiplication, Writing by Squarehead Teachers. Bookmark the permalink. The Sharpie paint pen thing has changed my world this year! 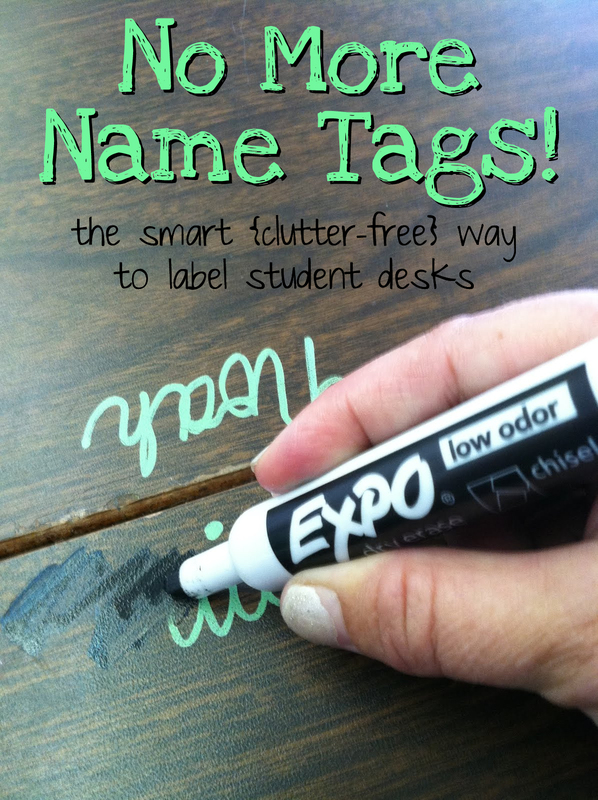 I can erase and re-write names as needed, but the kids can’t peel or damage the names. My desks look great. I did notice one child trace over his name with pencil but because he traced his own name, I was able to nail the perpetrator. Highly recommend! Sweet! Good to have other teacher recommendations on the idea! Thank you!